Photo: Joel Lockwood in the pool, ca. 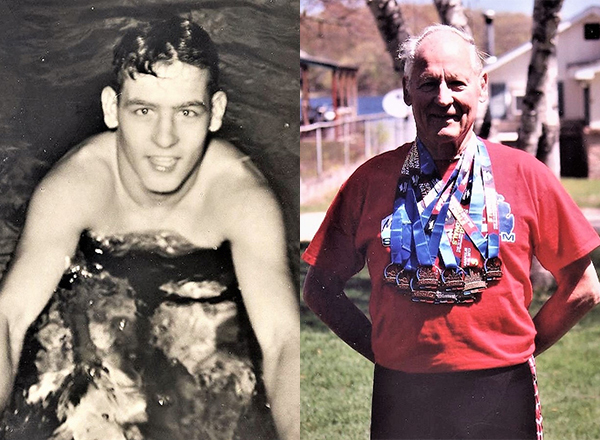 1952, and Lockwood today with his swimming medals. After a 55-year hiatus, Joel Lockwood is back in the pool – and setting records. Just as he did back in his youth. “I found out new things about swimming: There are starting blocks, and we have to wear goggles. We never had that in the 1950s,” said Lockwood, 84, of Lake City, where he lives with his wife of 65 years, Dixielee. Together, they have two children, five grandchildren, and two great-grandchildren. Lockwood attended HFC in 1953 (when it was Henry Ford Community College), where he undertook coursework in general studies. 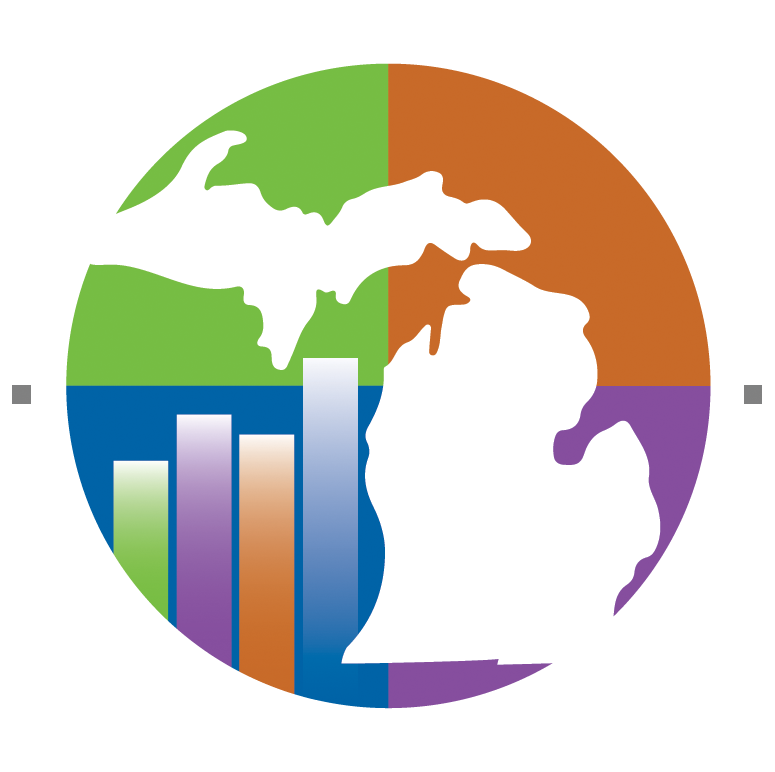 In August of this year, Lockwood took his swimming talents to Oakland University, where the Michigan Senior Olympian qualified for the National Senior Games, to be held in Albuquerque in June 2019. He competed in four events: the 50-yard backstroke with a time of 45 seconds; the 100-yard breaststroke with a time of 1:57; the 500-yard freestyle with a time of 8:44; and the 100 individual medley, where he swam the butterfly, the backstroke, the breaststroke, and freestyle with a time of 1:57. When he returned to swimming in 2012, Lockwood set a record for the 500 yard freestyle in the Michigan Senior Olympics with a time of 8:02. Currently, Lockwood is in the 80-84 age bracket. When he attends the National Senior Games next June, he’ll be 85, competing in the 85-89 age bracket. Growing up in Dearborn in the 1940s, Lockwood attended summer camp at the Saginaw YMCA for three years. That was where he learned how to swim. At Dearborn High School, he was on the swim team for four years. He earned three varsity letters and was captain his senior year. During the 1951-52 academic year, his swim team won the state championship. After graduating in 1952, Lockwood attended HFC, where he earned All-American Junior College honors in the 220 and 440 freestyle events. At the time, there wasn’t a swimming pool at either DHS or HFC. Lockwood recalled using the pool at Henry Ford Middle School when he swam for both schools. Lockwood continued his swimming career in the U.S. Army in 1957, when he was stationed at Fort Carson, CO. He set new records in the 1,500-meter and 400-meter events at the Fifth Army Swimming Championships. “They found out that I could swim when I went through basic training, and I never left Fort Carson,” he said. After getting honorably discharged from the Army after four years, Lockwood attended Wayne State University in Detroit. For the next several decades, he concentrated on his engineering career at General Motors and raising a family. Swimming took a back seat. It wasn’t until 2012, at the age of 78, that Lockwood returned to competitive swimming. His neighbor informed him about the U.S. Masters Swim Program, a nationwide competition for all athletes, regardless of age. During the next several years, Lockwood established several state, national, and world records for his age bracket. A pinnacle was winning a silver medal in the 100-meter freestyle at the 2014 World Masters Swimming Championship in Montreal. In 2016, at the 64th Annual Sports Awards Ceremony in Dearborn, Lockwood was honored with a Sports Legend Award and was inducted into the Dearborn Sports Hall of Fame. And now, he has no plans to quit.